2 015 is the “European Year for Development”, marks the end of the Millenium Development Goals and offers an exceptional opportunity to agree on a new development agenda for the next 15 years. 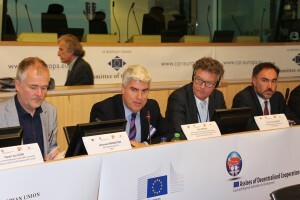 In this context, the Regional and Local authorities met in the Committee of the Regions on 1-2 June 2015 for the 4th edition of the Assises of Decentralised Cooperation. The CPMR External Cooperation Working Group, represented by the Basque Country which chairs the working group, offered its contribution to the debates with Paul Ortega, Director of the Basque Government Cooperation Agency, who participated both in the Plenary Session and in the Round table “Agenda post 2015: Universality and Territorial Approach to Development”. During this round table, different messages were underlined by the participants focusing on the full implication of Local and Regional Authorities in the agenda Post-2015, on exporting the EU regional development model in the international cooperation process, as well as on the territorial dimension of decentralised cooperation containing different principles that the Post-2015 Agenda is willing to promote at the universal level, such as horizontality, equal to equal work and mutual learning. Representing partner countries, Guillermo Herrera Villareal, Prefect of the Carchi Province in Ecuador, called for a “Multilevel governance having universal objectives”, underlined the importance of “involving the whole civil society in the final decision making process” and pointed out that “territorial development should go beyond national borders especially in trans-border regions”. The European Parliament was represented by its Rapporteur on the agenda Post-2015, Davor Ivo Stier (MEP), who “would like to see Local and Regional Authorities involved not only in the implementation, but also at the beginning of the process of decentralised cooperation. In this way the whole process is more inclusive and can bring more results”. Since July 2014, the Basque Government (Basque Cooperation Agency and the Basque Government Delegation to the European Union) leads the External Cooperation Working Group of the CPMR. Its main objective is to call for the principle of territorial dimension and to monitor and assess the effectiveness and impact of decentralised cooperation vis-à-vis the EU as well as national and international agendas.